I'll start day 21's "USA Revisited" blog post with a question from Simon Collett who is one of my followers on Twitter (@simonc77). Simon asked "What did you find harder to conquer everyday. The mental challenge or the physical challenge?". Thanks for your question Simon. It's one that I get asked on a regular basis and have yet to provide a decent answer. Until now, I hope! 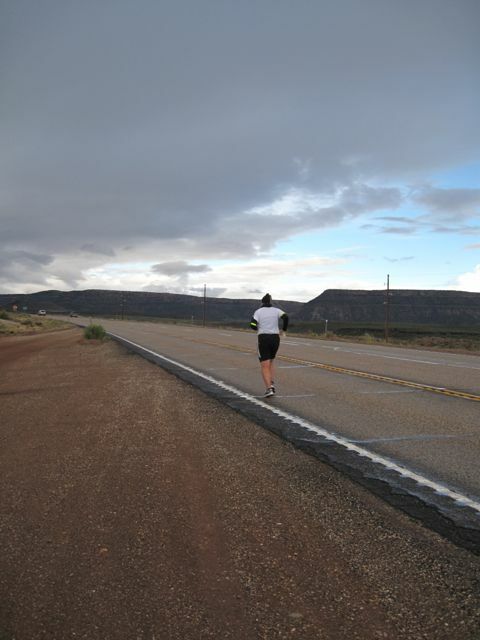 I always expected that, based on my previous run from John O'Groats to Lands End in 2007, the run across the USA would require, say, 80% physical strength and 20% mental strength at the start. By the time I got close to New York, I expected that statistic to have flipped on it's head with 80% mental strength required and 20% physical strength. I had previously believed that you could roughly represent the personal effort required to run across the USA in those terms. This wasn't always the case however. What actually happened on a daily basis during the run was not quite so cut and dried and was dependant on many factors. There are so many things that happen on an endurance event of this magnitude that can affect your physical and mental wellbeing. The two main factors affecting physical state are the daily mileage and environmental conditions. You could also add into that the amount of sleep and recovery time you get between days or even sessions during the day. I suppose the food that I ate is also worthy of mention. Needless to say that the first 20 days had been very tough physically. 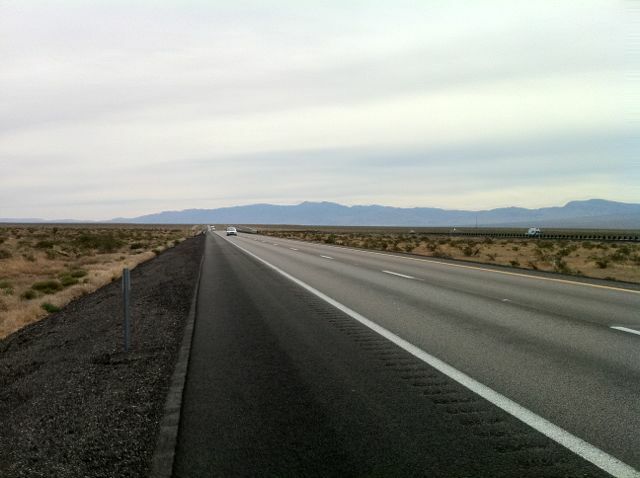 Having to run 30+ miles in the temperatures that I experienced in the Mojave Desert was very demanding on the body. Running at altitude was tough too. 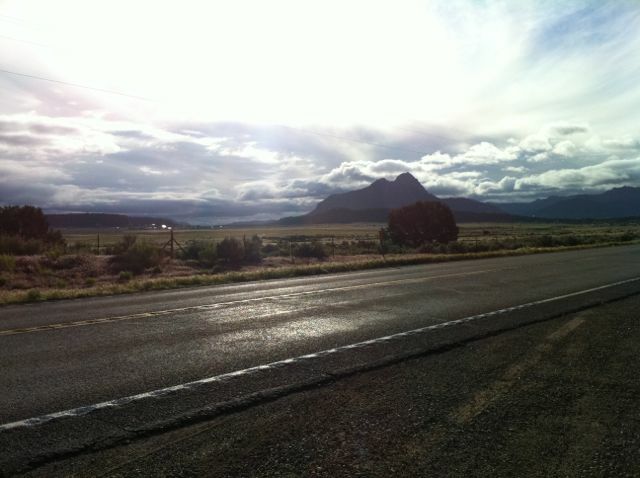 As you'll see over the coming blog posts, I spent a lot of time running at an altitude of over 6000 ft. There are so many factors that contributed to my state of mind. Being away from my family was the biggest one. Thinking about the daily and overall distance that I had to run would constantly play on my mind. The almost ever present mileage deficit as you will see around day 90 was one of the biggest threats to the run. The mood and behaviour of the support team effected me on numerous occasions. I could go on. With all of the above factors changing on an almost daily basis there was an ever-changing set of mental and physical challenges to overcome. No 2 days were ever the same. No 2 hours were ever the same. No 2 miles were ever the same. You'll see that some of the physical challenges I write about over the coming 80 posts were incredibly difficult to overcome. As it turned out, it would seem that I was actually quite well equipped to deal with them. Who knew?! The mental challenges, that you will read about, however, quite literally brought me to my knees at various times. 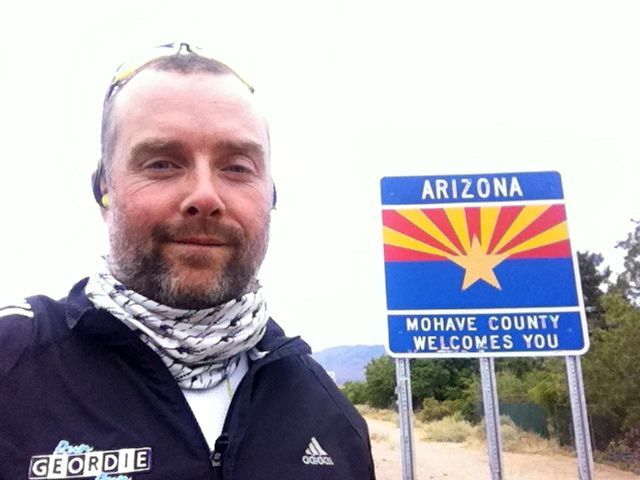 To answer Simon's original question, I think that conquering the mental challenge was the most difficult out of the 2 aspects of the run across the USA. The mental strength and effort required to complete the run across the USA was considerable. Over the final 80 blog posts, I'll be writing about the various tricks and techniques that I used to win the mental battle. I'll be writing about how and why I nearly lost that battle. I hope that's a decent enough answer Simon. It's a really difficult question to answer. Thanks for taking time out for sending it. I'm happy to answer any other questions in future blog posts. 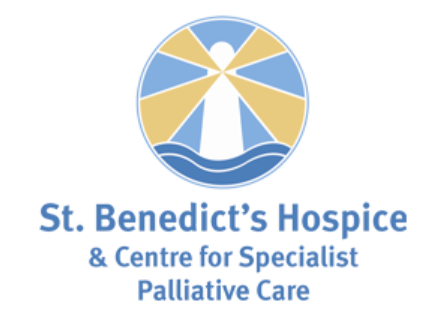 Please email them to sponsorship@rungeordierun.com. Meanwhile, back to day 21 which started with a brisk massage from Kirsty who said "Day 21 saw a change in tactics, a pre run massage to wake Mark’s legs up nice and early to get a large percentage of the days mile done so there wasn’t a panic at the end of the day. This seemed to work really well and Mark seemed a lot happier with this, probably as he was able to sleep some more while I massaged!". Kirsty is spot on with her comment there. As well as having a benefit to my running, an early morning massage meant more time to sleep. It took about 20 minutes to complete which bought me valuable extra resting time before the inevitable daily haul of miles started. 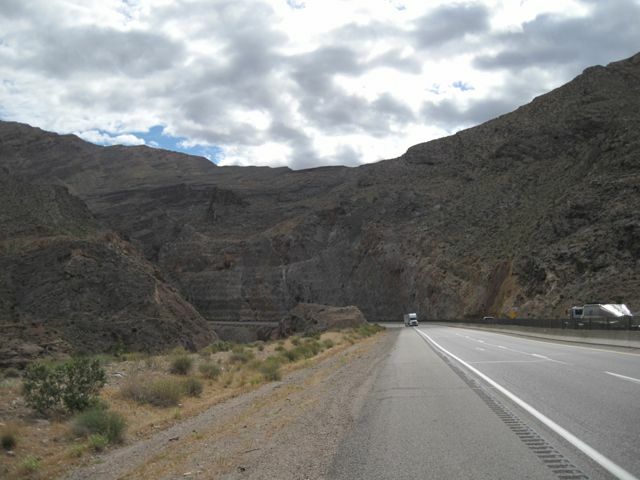 As I set off from Bauers Canyon Ranch RV Park in Glendale at 5850 ft I found that my legs felt a lot more loose than normal. The rest of me, however, was very sleepy. I'd spent a lot of time the night before updating the blog and answering tweets and emails. It was a beautiful sunny morning as I made my way up Long Valley, Utah. The temperature still called for a few layers and a wooly hat though. 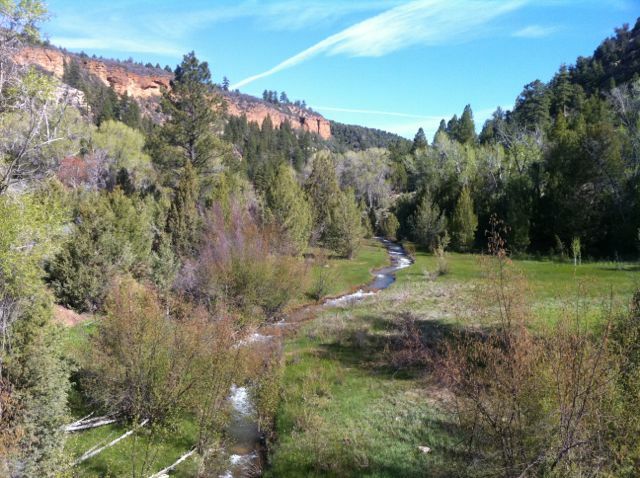 There were pastures with horses grazing, fast flowing streams and the odd waterfall. 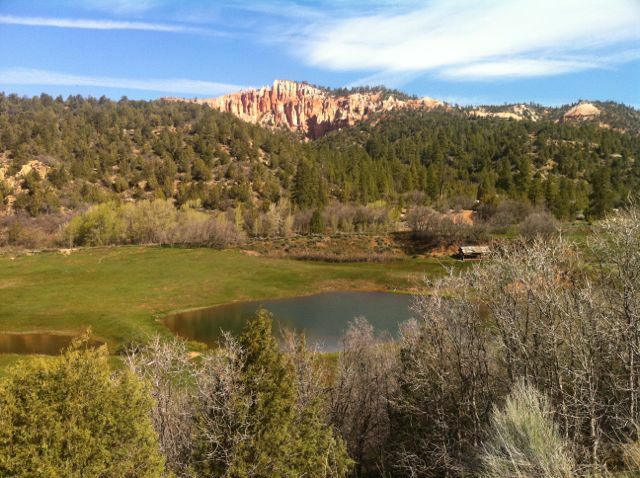 It was one of the most beautiful settings that I have ever ran in nestled between the Dixie National Forest and Bryce Canton National Park. The climb away from Glendale was every bit as challenging as it was spectacular. It was 7.5 miles before I reached the first false summit at 6828 ft. 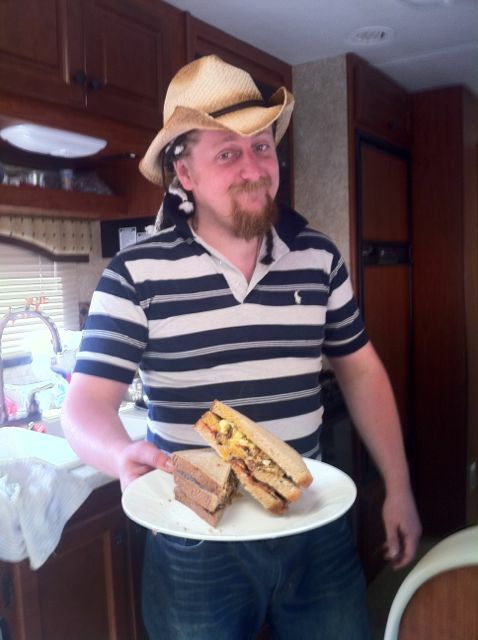 It was at this point that I had a triple decker bacon and egg sandwich as cooked by Stephen (pictured below). It had the salt and fat that I craved. I'm certain that I could have eaten something more healthy but it's what by body appeared to be screaming out for. I set off again, still very sleepy and still climbing up Long Valley. The scenery continued to amaze me, mile after mile. The weather continued to be fantastic too. The higher I climbed the more green and less red there appeared to be. I found myself having to take bigger gulps of air the higher up I got. By the time I reached the day's summit of 7450 ft after 14 miles of running I felt so sleepy. It was time for a tactical snooze! The 10 miles after the tactical snooze, with a drop of just 400 ft, were much quicker than usual. Unfortunately, I had to stop to refuel as I felt I was running on empty. This was such a shame and I lost all of the speed in the final session of the day. I could see some huge mountains in the distance during the final session of the day. I stopped running after 30.2 miles when a bit of broken skin on my left foot became very sore. My feet had been relatively pain free and unswollen for a whole week so I suppose something was due to happen to them. I summed up the day in the following tweet to David Fairlamb "@DF_Fitness Tough start (14), quick middle (10), slow finish (7)". I think that it was a fair assessment of day 21. The day ended with a fundraising total of £33,079.53. That meant that £1000 per week had been raised during the 3 weeks that I'd been running in the USA. I knew that the weekly figure would have to increase slightly if I were to reach the target of £50,000 by the time I reached the finish line in 11 weeks. Day 20 started with a bowl of "Wheaties" that were marketed as the "Breakfast of Champions". The energy they provided lasted about 3 miles! I rarely ate anything other than porridge for breakfast after that incident on the run across the USA. 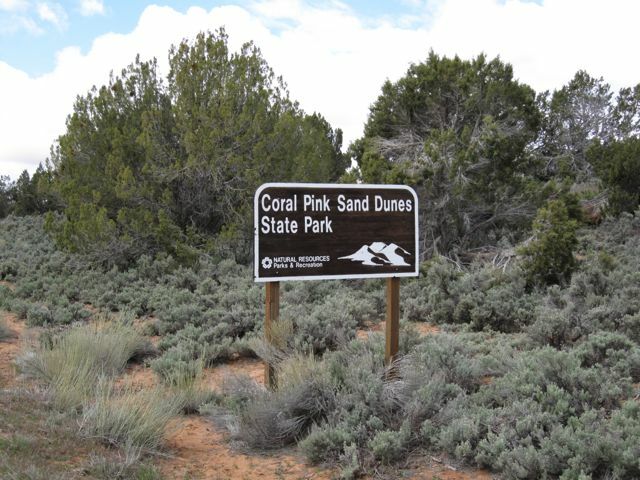 It was nice to wake up in Coral Pink Sand Dunes State Park right on the Arizona/Utah border. The support team (including Comedy Jon pictured below) had enjoyed a look around the surrounding area. It's a shame I didn't have the mobility or time to join them. This wasn't to be the last time during the run across the USA that I wouldn't have time to stop off and have a look at the local sights. That's not a complaint by the way. There was a job to be done. Eat, run, eat, snooze, run, eat, run, eat, blog, sleep was the typical order of the day. It was a very misty start to day 20 and 3 layers were required to keep warm at 5659 ft. The support team dropped me off 7 miles away from Coral Pink Sand Dunes State Park and I ran back to meet them for a second breakfast of porridge then pasta! 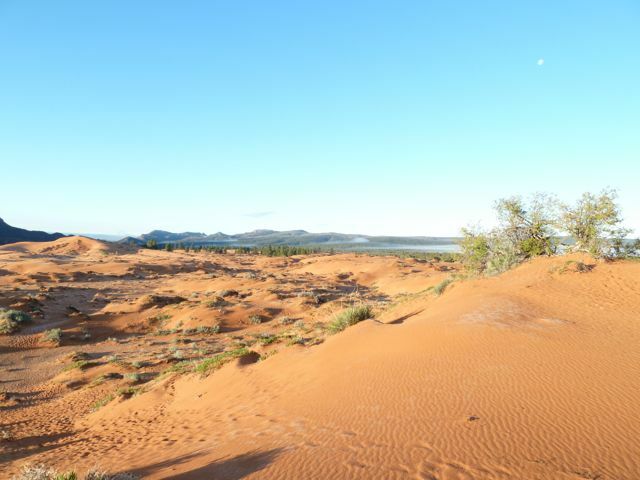 The scenery in the state park was amazing and I could see several quad bikes driving up and down the frost covered dunes. 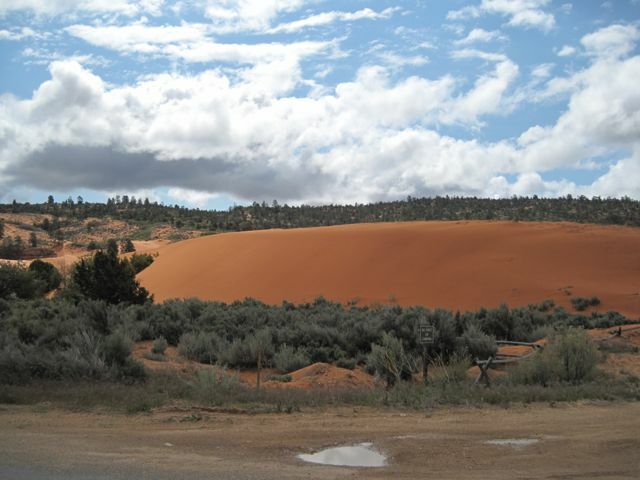 The Dunes were formed from the erosion of pink-colored Navajo Sandstone surrounding the park. High winds passing through the notch between the Moquith and Moccasin Mountains pick up loose sand particles and then drop them onto the dunes. The dunes are estimated to be between 10,000 and 15,000 years old. The second session of the day was 10 miles long. That's Kirsty pictured below at the 14 mile point. The RV then moved on to the other end of the valley and park up at the 17 mile point. At the 17 mile point Kirsty and Jon did some washing and drying of my kit. I later found out that it was a job that Stephen refused to do stating that "it wasn't what he'd signed up for". 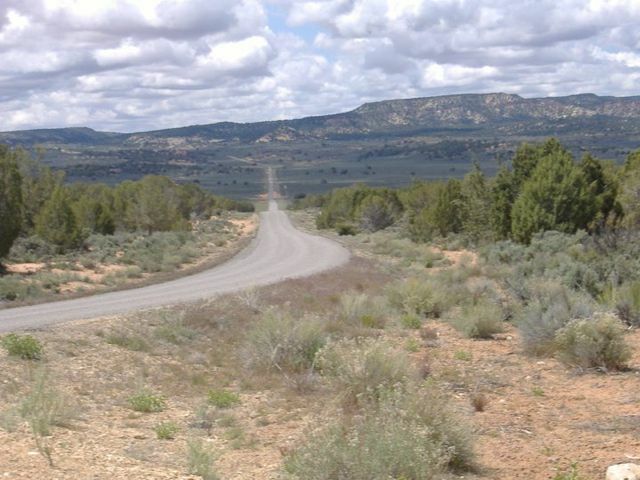 I took the picture below at the 17 mile point looking back down the road which was 4 miles long. I'd been able to see the RV, in the distance, for quite some time. "So near, yet so far" I kept thinking. After some more pasta, I had a tactical snooze along with the rest of the support team at the 17 mile point. I used to try and limit the snoozes to about an hour. Sometimes I felt needed longer. If I slept for more than 1 hour I'd either feel better or worse. You could never tell how I would respond after a tactical snooze. This particular one saw an improvement in pace afterwards. 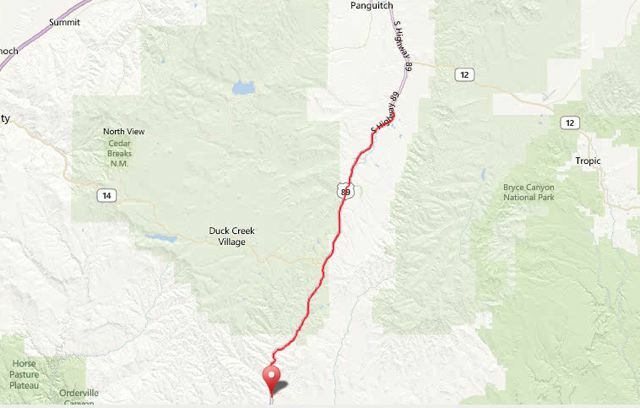 I joined Highway 89 after 18 miles of running. I immediately hit a huge down hill stretch and the traffic was noticeably busier. Another 3 miles of downhill running saw me reach Mt. Carmel Junction where the team had managed to find some free wi-fi. 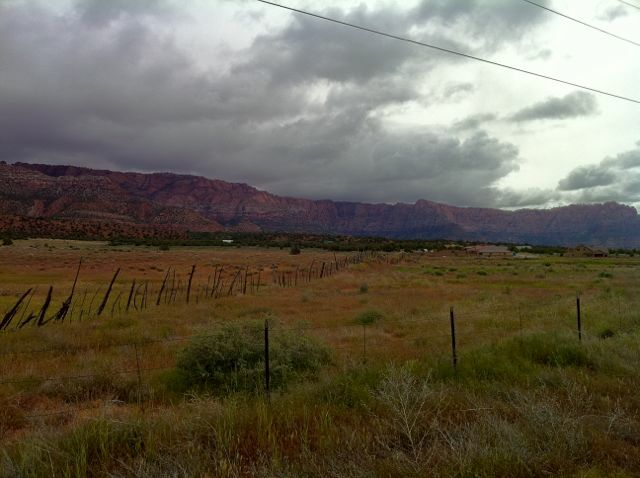 To the west was the Zion National Park. 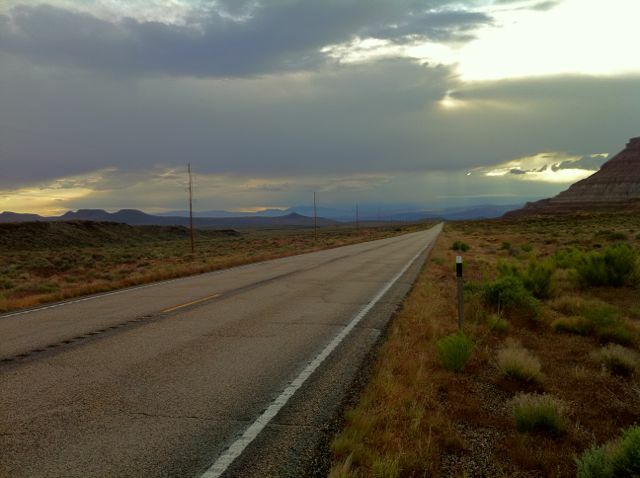 In the early days of planning the route across the USA I'd hoped to run through it. Unfortunately, this wasn't possible due to the tunnel that didn't allow pedestrians to travel through it. 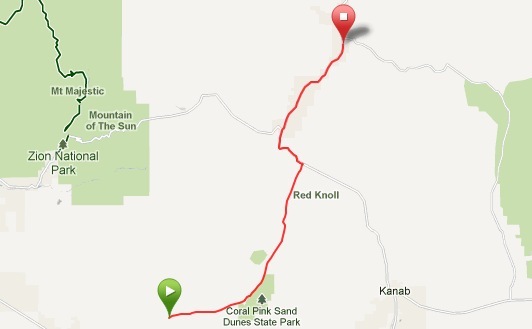 The rest of the day's route took me up the Long Valley Scenic Byway. It lived up to it's name and there was lots of lovely scenery to take in. I was stopped by some Americans at the 25 mile point and I gave them the directions they asked for. Needless to say that I was very familiar with the surrounding area! I met the RV for the final time after 30.3 miles of running. 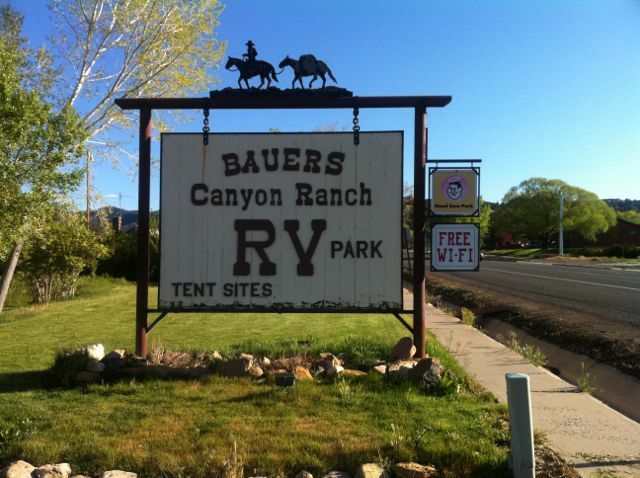 Comedy Jon had played a blinder in negotiating a free night at the Bauers Canyon Ranch RV Park. We didn't have a hook up to electricity or waste/water services but it was a safe place to stay. It had been a tough old day. The first of many in Utah where I would do a lot of climbing. This particular day had seen an elevation gain of 2011 ft with a drop of 2005 ft. Those statistics meant that I would have to put ice packs on my shins overnight. This was to ensure that I didn't get the dreaded inflammation in my shins. A condition that had plagued me during the build up to the run across the USA. Thanks to Comedy Jon's shortcut on day 19 and a good day of running on day 20, the mileage deficit was down to just 27 miles. That was taking into account my 2 contingency days. Based on an average of running the required 31 miles per day I was actually 54 miles behind schedule. Never mind! All things considered, I was happy with 566 miles after 20 days. I was also happy that the fund had exceeded £30,000 on day 20. There was only one way to celebrate and that was with a sports massage from Kirsty on my calfs, feet and lower back. The final action of the day, as ever, was to update the blog. The hits kept growing the more I continued to update it. Despite my tiredness it was imperative that I told the readers what a great day it had been. It was another day on the run across the USA and, with that, another day of waking up to some great fundraising news. While I was sleeping in a very cold Apple Valley, the fund had crept up to £32,914.53. I say "very cold" despite Comedy Jon discovering that the RV actually had a heating system. This seemed to benefit everyone but me as I felt really cold during the night. Upon further investigation, it appeared that my running shoes had been blocking the heating vent in my bedroom. Gutted! The cold start to the day required 5 layers of clothing. It didn't matter though, as the beautiful scenery really helped take my mind of the cold and any aches and pains that I had. You may notice that I haven't mentioned blisters for a few days now. They were well under control by day 19. The swelling in my feet was greatly reduced too. I stopped at the 11 mile point to talk to Simon Pryde, John Anderson and Marco Gabbiadini on BBC Newcastle's Total Sport show. I had plenty to talk about and the lads asked some great questions. 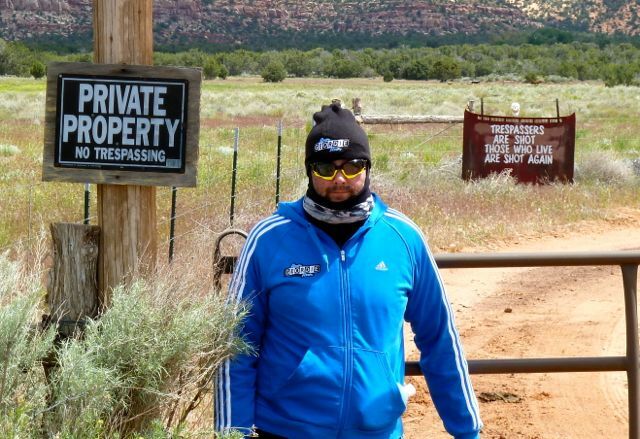 Soon after that interview I paused for photos in front of a sign of a rather "threatening nature". I'm sure it was just tongue in cheek! 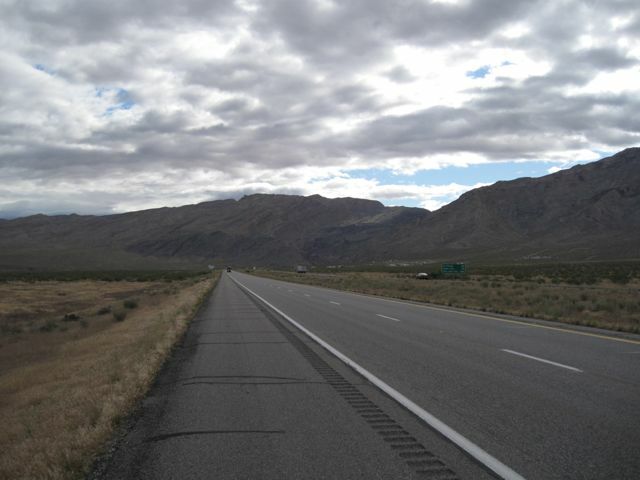 Taking previous advice from Shelli, I was accompanied by Comedy Jon as I approached the Utah/Arizona border just north of Colorado City. Stephen took over driving from Jon at the Merry Wives Cafe. 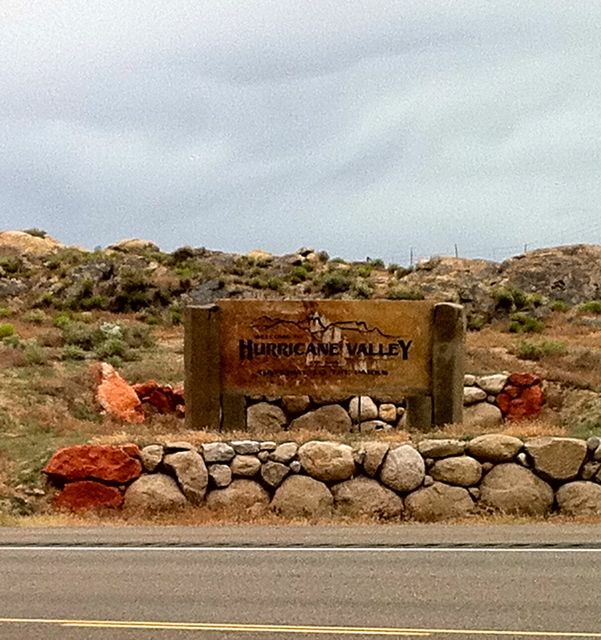 It was aptly named as Colorado City is where the Polygamist community lived. i.e. one husband married to multiple wives. According to Shelli, the people in this community didn't take kindly to strangers. I always found that Shelli overreacted about most situations. This was certainly one of those occasions and I ran back into Arizona and right past the city without incident. As we turned off the main road, after 16 miles of running, Stephen and Kirsty passed us in the RV. Much to both Jon and my horror, Stephen didn't observe any lane discipline and almost crashed the RV into a passing car. It was his first attempt at driving and he was very lucky that it didn't end in disaster. It was at this point that my GPS watch started beeping at me, stating that it's memory was full. I had to stop for 10 minutes to offload the data to my laptop. 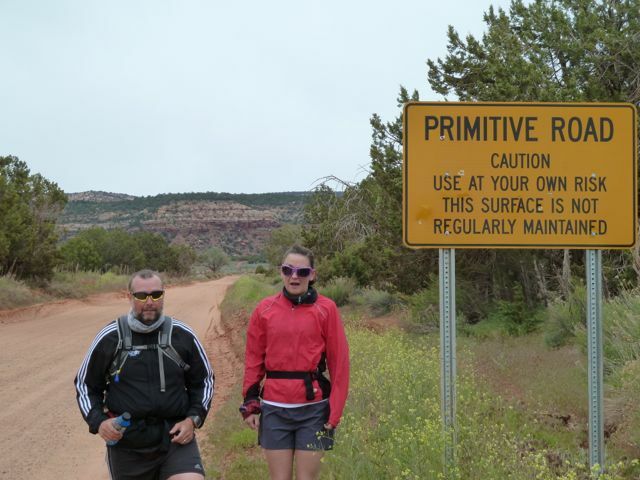 After a bite to eat, Kirsty (pictured with me below) joined me for the remaining miles. Comedy Jon had found a 20 mile shortcut but unfortunately it wasn't fit for the RV to drive on. It started to absolutely chuck it down with rain and Kirsty and I were soon soaked right through. 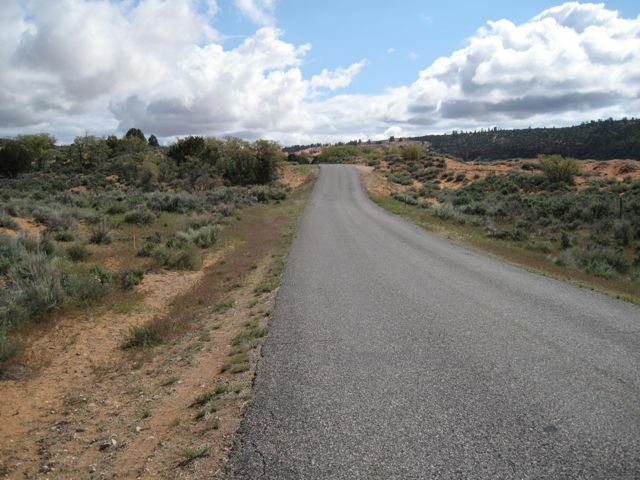 We made it to the 27.1 mile point for the day when the RV arrived having taken a huge detour via Kanab on my original route. We parked the RV in Coral Pink Sand Dunes State Park. The team said that they had a surprise for me. Much to my delight, it turned out to be a barbecue! With Steak! The Support Team had pre-planned this and it was a nice surprise to eat something that wasn't pasta or porridge. After dinner, we listened to some of Comedy Jon's very interesting and funny stories. We were in stitches of laughter. Stephen tried to pitch in with one of his own stories, claiming that he was named after the US actor Patrick Duffy. With his full name being Stephen Cook we never managed to work that one out! Fortunately, his pasta making skills were a million times better than his story telling skills! The one frustrating thing about day 19 was that I had no internet access and was unable to update the blog and tell everyone about the day's happenings. At least it meant that I could get an early night. After a massage from Kirsty of course. 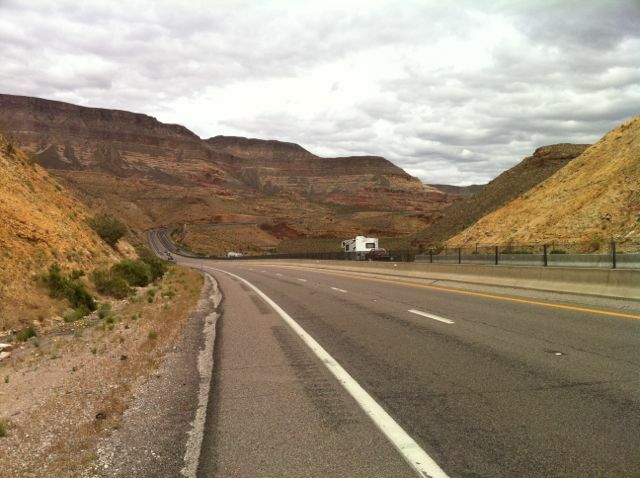 Day 18 saw a cold start in Utah on Interstate 15 just south of St George. 3 layers were called for on a day where a good threat of thunder and lightening was present. The first 2 miles were through some road works where the hard shoulder would disappear every now and again. It was a dangerous place to run and meant a quicker than usual start to proceedings. I eased off the pace when I turned off the Interstate and into St George. St George seemed to be a nice little town surrounded by some very interesting rock formations. I was enjoying running through it until the rain started. I got absolutely soaking wet and when I met the RV at the 7.5 mile point I found that my energy levels had hit rock bottom. I had a craving for fatty salty food. After a bit of persuasive talking, Comedy Jon bought me 2 McGriddles from a nearby McDonalds. Say what you want about that particular chain of fast food restaurants but they were absolutely delicious. Just what I felt I needed at the time. The next 6.5 miles included a nice climb through and out of Washington City. I stopped to talk to Katy and Jack on Skype. After the Skype call Comedy Jon told some very funny stories. His banter always seemed to lift the team's spirits. 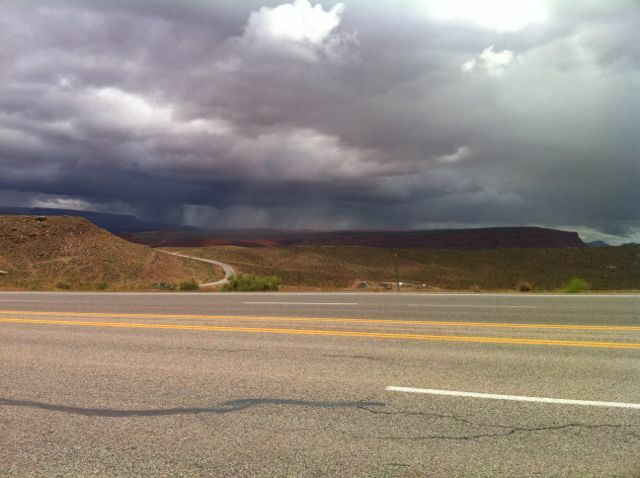 As I made my way down Hurricane Valley, I could some huge storm clouds in the distance to my right (south). These hung about for most of the afternoon. The area around Hurricane Valley was a lot greener than anywhere I'd ran up to that point in the USA. To see the landscape change so much over the course of just 18 days was particularly fascinating. I could see big mountains in the distance as I got further into Hurricane Valley. I was quite familiar with my route and was fully aware that I would be running up one of them later that afternoon. I met the RV at the 22 mile point in the town of Hurricane where the team had managed to find some free wi-fi. Just to the east of Hurricane was a steep climb from 3200 ft to 4310 ft. The temperature dropped as I started climbing and I changed into winter gear half way up the climb. It was quite cold and hard to get my mind round the fact that just a few days earlier I was suffering in the heat of the Mojave Desert! As had been the case on previous days, I started running a lot quicker up the steep climb. I have no explanation for this but the increased pace whenever hills were present was to feature throughout the run across the USA. 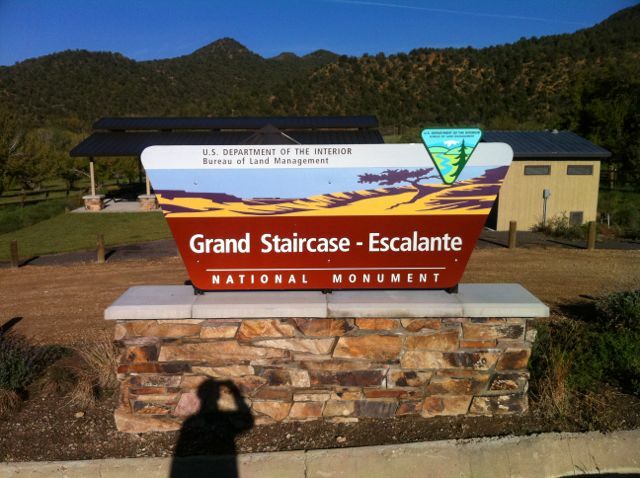 I soon reached the summit of 4310 ft after having ran a total of 27 miles. The support team and I paused for photos and I was soon on my way again for the final session of the day. I took the opportunity to look back down East Highway 59 (pictured below) on more than one occasion. 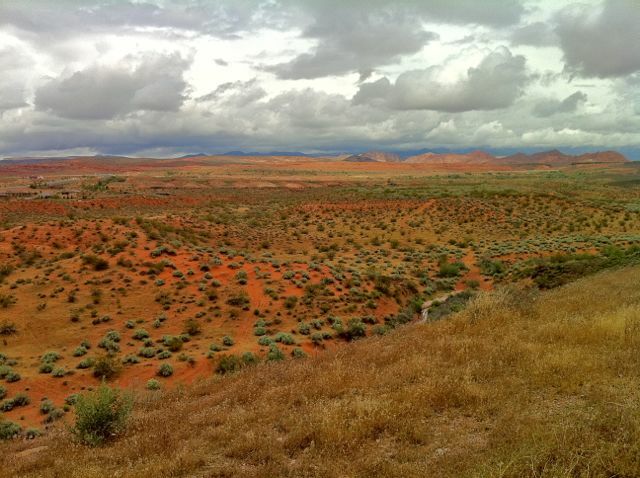 I could just about make out the hills that I'd ran up to get into Utah the day before. It's moments like that when you get a real sense of just how far you've ran. Those hills must have been about 40 miles away! The climb over the next few miles revealed, not only, further beautiful scenery but my final destination of the day; Apple Valley (pictured just around the corner in the image below). I reached the final summit of the day at 4690 ft after having ran 30 miles for the day. It was probably the highest altitude that I'd ever ran at. I knew that there was plenty more climbing to be done as I'd be reaching over 11,000 ft in less than a month's time. I stopped running after 32.25 miles. I felt in pretty good shape despite the distance ran with 3400 ft of climbing into the bargain. You can see the final steps of the day in the video clip below. You may notice the not very scientific method that I used to record the exact end point. 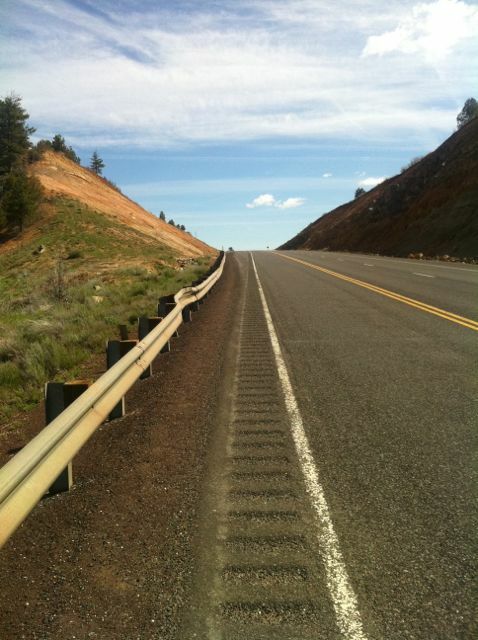 Day 18 saw the 500 mile barrier of the run across the USA broken. It was the first real milestone that I'd achieved in the USA. 508 miles with climbs of 25,654 ft had taken 157 hours to run over 18 days. Approximately 66,000 calories had been burned over that time. 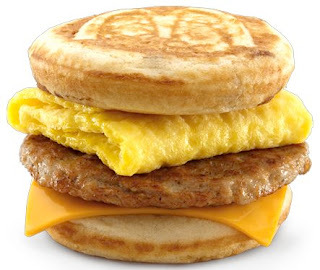 Coincidentally, that's exactly the equivalent of 157 McGriddles. I was exactly 50 miles behind schedule. This particular stat always played on my mind. It was very easy to lose mileage but almost impossible to make it back up again. 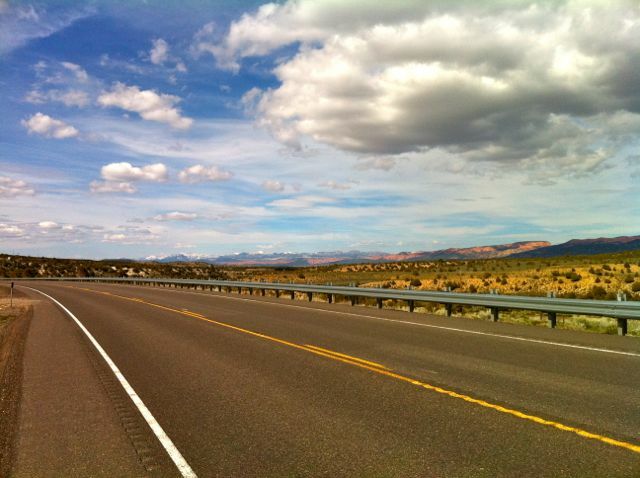 You'll see over the remaining "USA Revisited" series of blog posts just how bad the mileage deficit got and the almost catastrophic effect that it had on, not only the run, but my own well being too. 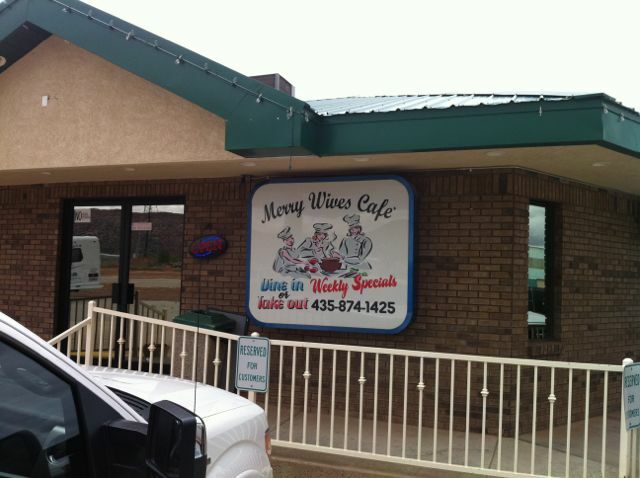 I dined with the Support Team in the Little Creek Gas Station in Apple Valley, Utah that night. The food was very good. Comedy Jon's funny stories and a sports massage from Kirsty's made a perfect end to the day. Day 17 started with Stephen singing in the RV at the top of his voice! 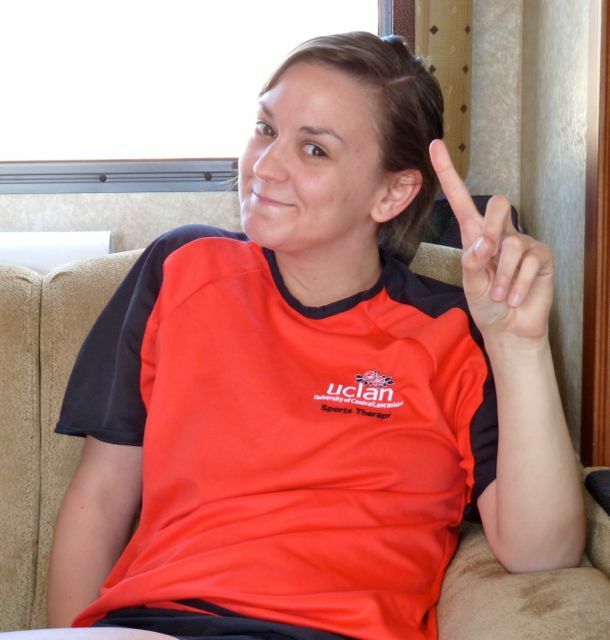 We soon established a new RV rule after that incident! 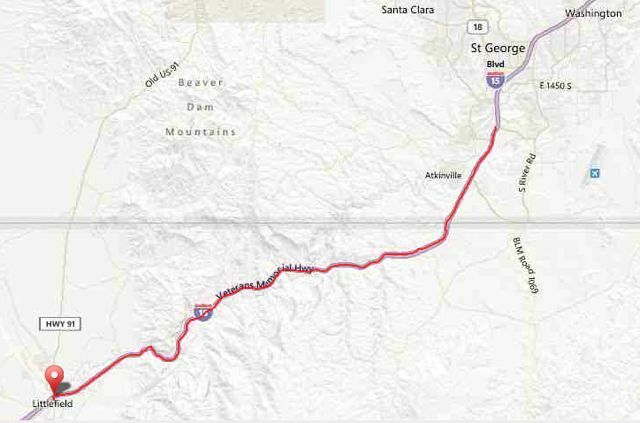 The route started at an intersection on Interstate 15. 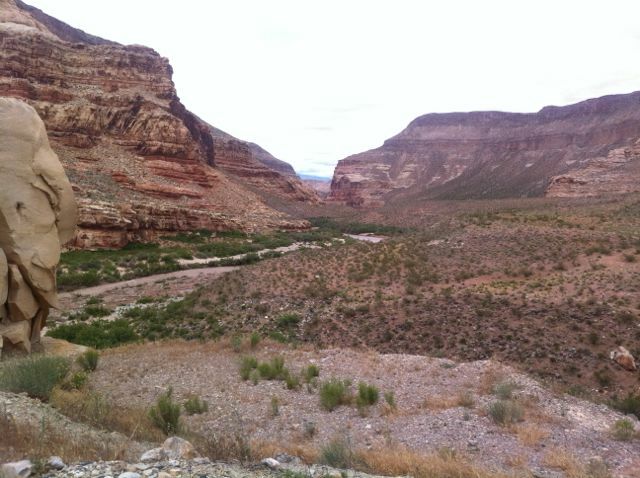 It would take 4 miles to reach the start of the Virgin River Gorge, which is apparently 500 million years old! 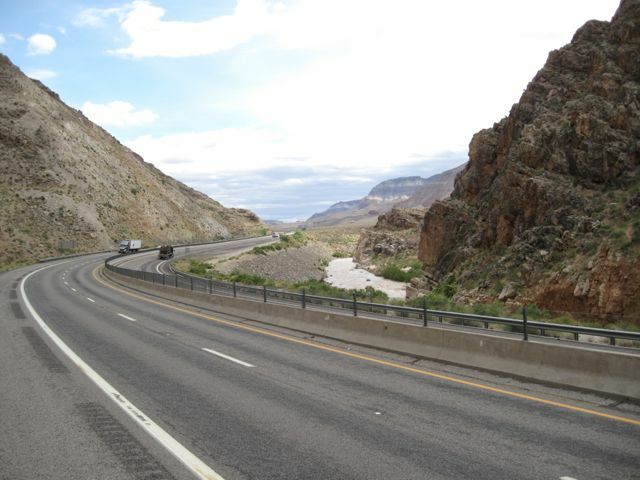 Construction of the Interstate road through the Gorge was completed in 1973. It involved re-channelling the river 12 times! 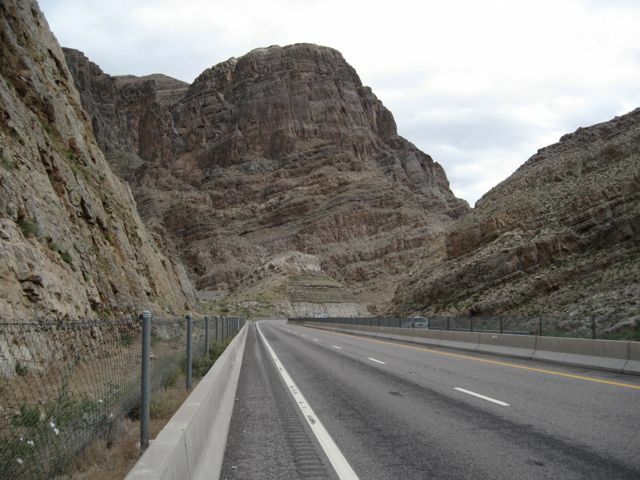 I've read that the section of the road through the Gorge was the most costly piece of rural freeway in the country, at the price of approximately $10 million per mile (at 1973 prices!). I entered the Interstate road ignoring the "No pedestrians past this point" signs. I was stopped by the police (again) 2 miles into the run. The officer suggested that, for safety reasons, I miss out the first bridge in the Gorge and follow an off road route alongside the river. In the build up to the run across the USA, I had spent a lot of time looking at this section of the route. 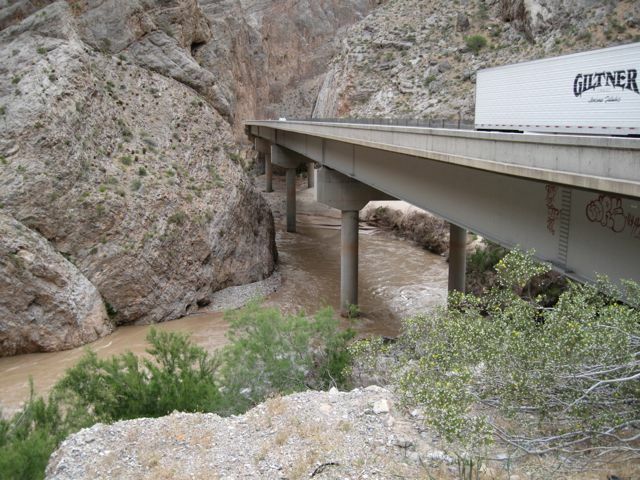 There were 2 bridges in particular that looked very dangerous with a very narrow or non existent hard shoulder and a low wall running alongside. I approached the entrance to the Gorge with great excitement. The scenery was breathtaking. I had a few nerves as I'd never had the chance to survey the off road section of the route before. My plan had always been to stick to the road despite the risks involved. I reached the first bridge after 5 miles of running. The road was quite busy and, given the lack of a hard shoulder, it was a very wise decision to take the police officer's advice and go off road. I found the route underneath the bridge that the police officer had been talking about. The river down below was not very clear and was light brown in colour. 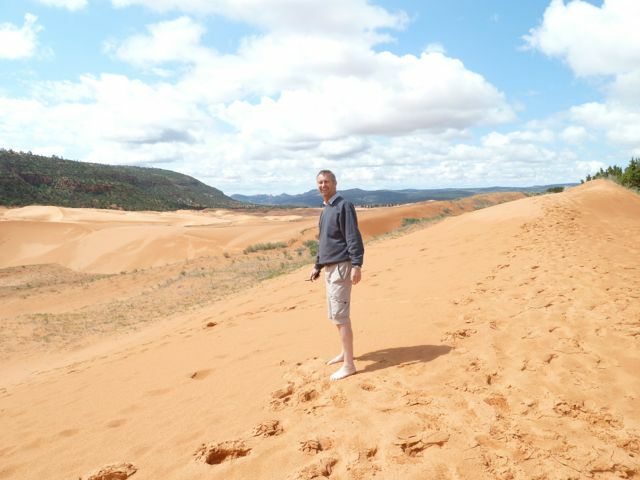 I soon reached a sandy section alongside the river. There were fresh hoof prints in the sand and I quickly made my way past several dark caves! 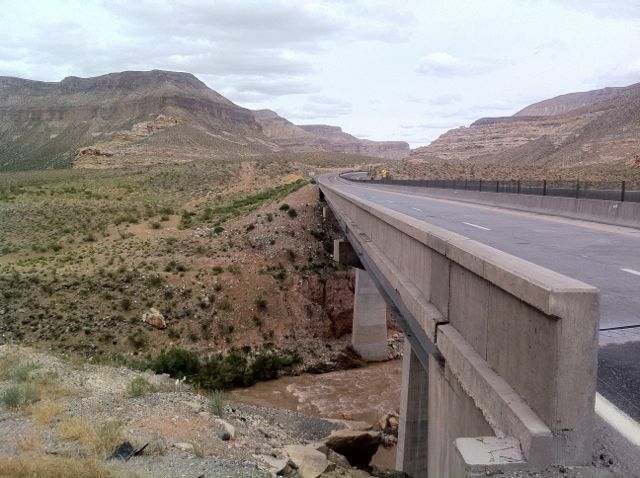 It didn't take too long to reach the other side of the bridge and I joined Interstate 15 once more. I was very tired after all of the clambering over rocks. The canyon was very deceptive. I couldn't tell if I was running up or down hill. The only clue was to look at the way in which the water was flowing. The HGVs were giving me plenty of room. Nevertheless, I was still on my guard with maximum concentration as they drove past. I stopped several times to take photos and to take in the scenery. I probably should have ran a bit quicker but there were so many nice views to take in. I reached the end of the Gorge and tweeted "Phew! Made it out of the canyon in 1 piece. That was tricky!". I met the support team at an intersection at the 10 mile point. 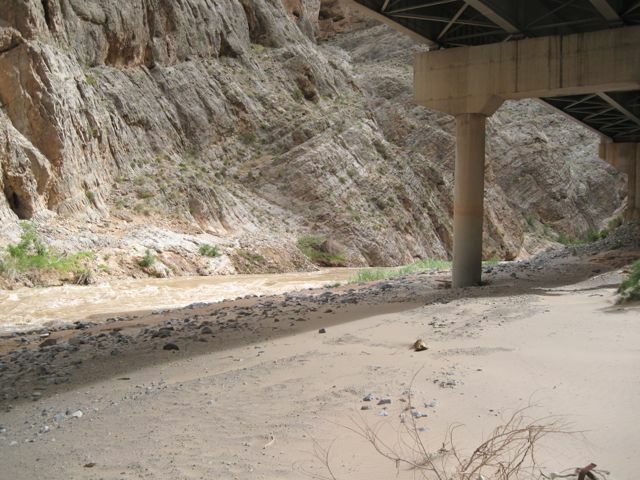 We drove to the nearby Virgin River Canyon Campground where a line of wet washing was drying. I was really tired and decided to have a "tactical snooze". I think listening to Gary and Lisa on Real radio and updating the blog the night before had taken it's toll. As well as running over 400 miles of course! I felt like a completely new person after that break. I was knocking out some much quicker miles too. There were a lot of climbs on that stretch and I was simply attacking them with great ease. Jon, or Comedy Jon as he was now known, made the following observation at that time. "Unfortunately we have a problem with Mark. A grumpy, dishevelled figure shuffled unhappily onto the freeway after a long sleep at 1:20pm. He was so rough I saw he had no Camelbak (told watergirl Kirsty he didn't want it) and wondered if he was capable of making a rational decision. Two and a half hours later, way ahead of schedule, he came off the freeway smiling, laughing, telling jokes and saying "Attack, Attack!" over and over. We have got to the bottom of it tonight (well Kirsty gets pretty close to that area anyway) and the answer seems clear. Mark appears to have been abducted by aliens during the afternoon and replaced by a clone . We don't know how long the alien presence will last, but we are hoping it's the rest of the trip ;-)"
Jon's observation was spot on. Mile 10 to 20 flew by with some very satisfying running. I remember stopping to talk to a traveller who was carrying his worldly possessions on his back. He had walked all the way from Alabama and was on his way to California. I was soon on my way again following an exchange of mutual admiration and respect. "Currently destroying some big climbs in a beautiful part of Arizona." "Legs feel brilliant. My @paddypower Bionic Ankle continues to feel strong too.". It was almost a year to the day since I broke my ankle and had 2 metal pins inserted. Paddy Power paid the 2 charities £250 to secure the naming rights for my ankle. Hence the name, The Paddy Power Bionic Ankle. "Open jaw moment. Amazing scenery. Pics later." At the 14.5 mile point I reached a bridge with no hard shoulder and a very low wall at the side. There was a considerable drop at the side of the bridge into the river. The traffic was reasonably quiet but the occasional HGV passed over the bridge. It was a very dangerous situation to find myself in! I timed my sprint across the bridge to perfection. This was more down to luck than good judgement. Thankfully, I made it to the other side without any traffic passing me. 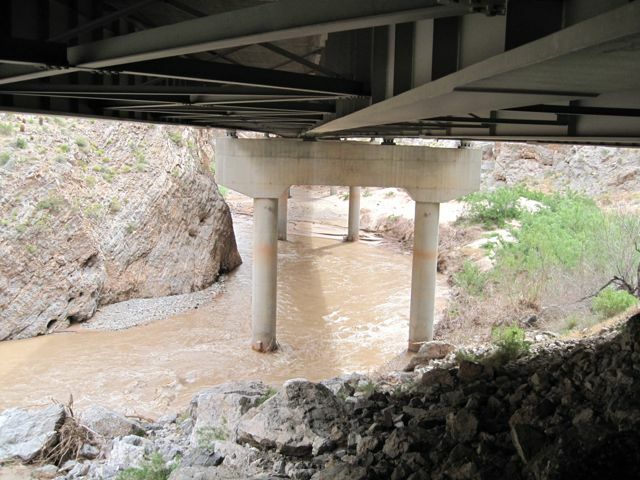 I wrote on my blog that Usain Bolt wouldn't have caught me as I ran so fast across that bridge. I reached the support team at the 2nd meeting point of the day (20 miles) to find that they were all fast asleep! They hadn't expected me for at least another hour. I had a right laugh with them during the second break at the 20 mile point. I told them that whatever we had been doing for the last 2 days we must keep doing. It was working! I started the final session of the day just after 16:00. 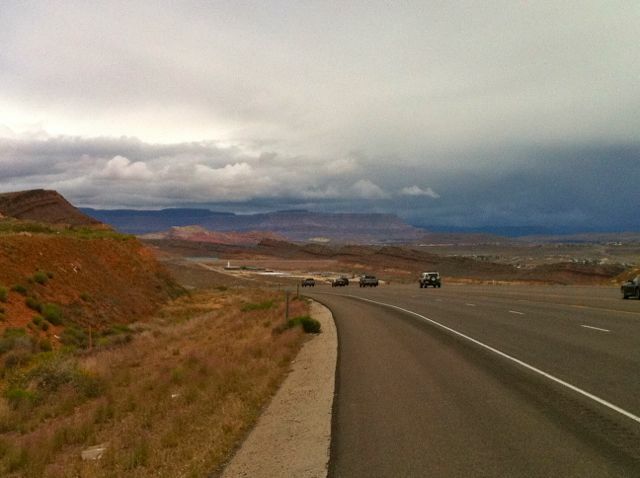 I entered the 4th state of the run, Utah, soon after. Once I got into Utah my GPS watch, being the clever piece of technology that it is, moved the time forward one hour as a result of the time zone change. This threw me for a bit and I felt very short changed at having lost an hour of time. I stopped running for the day after 26.1 miles. Even with over 2700 ft of climbing it was the quickest day of the run so far. Kirsty's massage, Stephen's pasta and Comedy Jon's wit were working very well. We retired to the Wal-Mart car park in St George for the night. The support team, saving water, used the facilities in Wal-Mart. Despite a shortfall in miles, it had been a brilliant day of running. The scenery had been fantastic. Making it into another state gave a feeling of progress and the support team was working well. "I had been following the blog before I joined the team, recalling in particular Mark stating how he was ONLY eating porridge and pasta and under NO CIRCUMSTANCES was he to have caffeine as it gave him a sore head..... I’d been with Mark and Jon for an hour or so before Mr Run Geordie Run was tucking into his first of any McDonald’s meals with us. From reading the blog, as much as it helped the reader to get a sense of what Mark was going through each day, it still doesn’t show the grit and determination that Mark put in every single moment of those 100 days. I don’t think anyone can really appreciate how hard it was, unless they were there. There were some days Mark was struggle to get down the few steps to exit the RV but would still complete the mileage we had set for that day. We could drive away with him in the worst mood ever, and see him an hour later having spoken to Katy and Jack or his mentors Dave (Fairlamb) and Mark (Fleming) and be a completely different person. They were the motivation as much as raising money and it was great to see. We decided that I would massage Mark at the end of each day and we would ice feet and any niggles as and when appropriate. We also had some team stretching as well. Before I joined the support team, it sounded as though Mark had been eating a very healthy diet, containing a lot of pasta dishes. I have some knowledge of sports nutrition and suggested Mark should try to eat more protein to ensure his muscles could repair themselves, and also he had to ensure he was eating enough calories to allow him to complete this mammoth task. I think Mark was overjoyed when I said he could basically eat what he wanted, as he would be working it all off anyways. So Mr ‘I only eat Pasta and Porridge’ was enjoying triple decker breakfast sandwiches, McDonald’s, massive pizzas, and whatever Stephen could muster up in the RV kitchen.". There was quite a slow start to day 16's running. This was probably due to yesterday's record breaking haul of miles. On the plus side, conditions were overcast and cool at the start time of 07:39 (Still on Pacific Time). If things went to plan, I would be in Arizona by the end of the day. That would be the 3rd state of the run across the USA after California and Nevada. 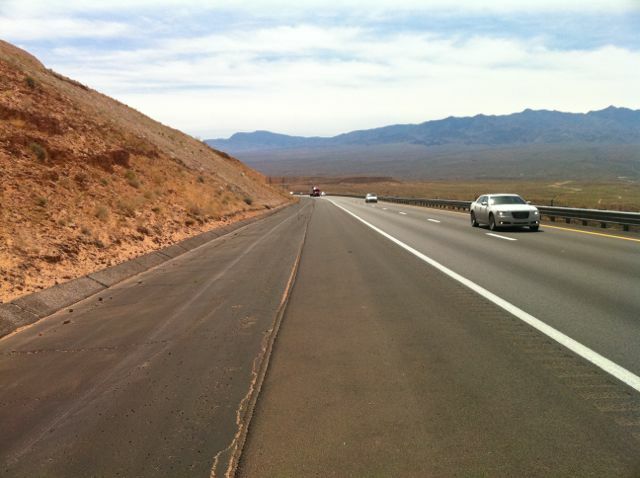 The first 2 miles were on a road parallel to Interstate 15. That road soon veered in a different direction. Luckily, Jon "found" a gap in a fence and I joined the Interstate again. I was on it for the next 16 miles. I got stopped by a Police car at the 8 mile point. The officer just asked if I was ok. I went through the now familiar drill of stating who I was, where I was running to and what for. 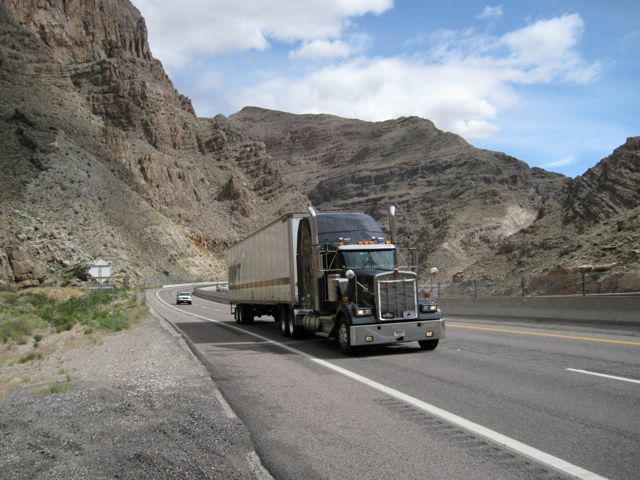 He wished me good luck and I continued on my way down the hard shoulder of south bound Interstate 15. 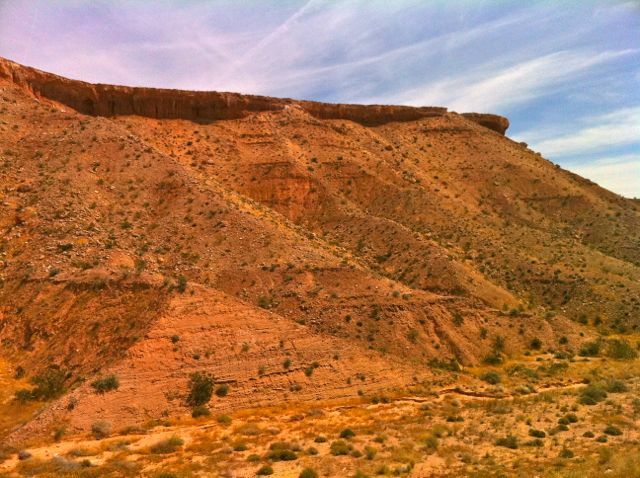 The scenery was stunning with huge sandy cliffs. As ever, this made the miles pass by a bit quicker. I was always mindful of watching out for the traffic. I never let the scenery disturb my concentration too much. The first break of the day was after 10.5 miles at an intersection. It was during this break that I discovered that I could update Twitter by sending a text on my mobile phone. It was a very old phone with very few features. It was very cost effective though and, thanks to Shelli, I was able to send texts to anywhere in the world for free. It was a lifeline to the outside world and the main method of communication with my family. I also discovered that I could receive a text for any mentions of @rungeordierun on Twitter. 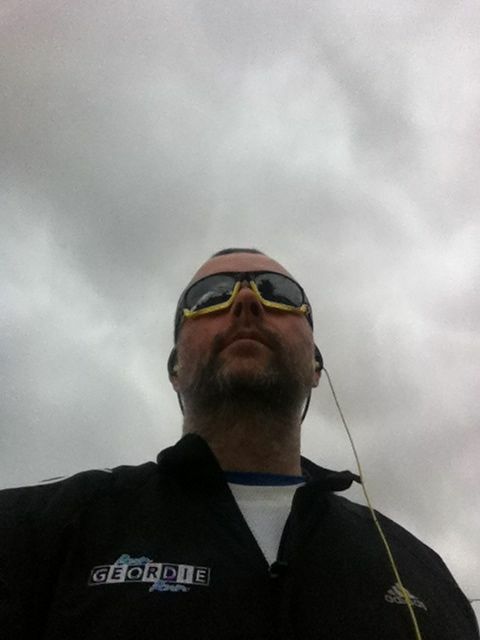 This was to prove very useful until later on in the run when @rungeordierun trended on Twitter and my phone went crazy. You'll be able to read more about that in a later blog post. The banter during the first break was first class. I liked this configuration of the support team. It was a lot of fun. Jon soon earned the nickname 'Comedy Jon'. He had a lot of life experience and, with that, a lot of stories. I loved listening to his tales of travelling the world and meeting various people. In the absence of a TV he soon became the entertainment. Kirsty would play along with the banter and Stephen would too when he was able to understand what was going on. After a steady descent in Mesquite I stopped for Pasta and salad. I'd managed 19 miles and was very close to Arizona. Mesquite seemed like a very nice little town and it was a relief to be off Interstate 15 for the first time in a while. 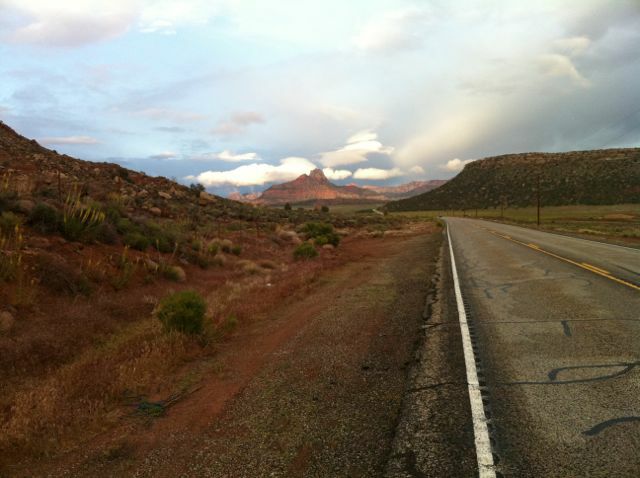 I crossed over into Arizona at 22 mile point. I stopped to change my running shoes (Brooks Glycerin 8) a mile later. I could start to feel the road in my current shoes and it was time for a new pair. It wasn't a problem changing into a brand new pair of shoes. My feet were no longer swollen and my blisters were no longer causing a problem. While I was changing my shoes I became very angry to find that Stephen was still using a lot of water in the RV. This was still the case despite lots of attempts to explain to him just how thrifty we had to be with the water in the RV. It was cheap enough to replenish but costly in time and fuel to do so. Time was one of the most precious commodities of all during the run across the USA. 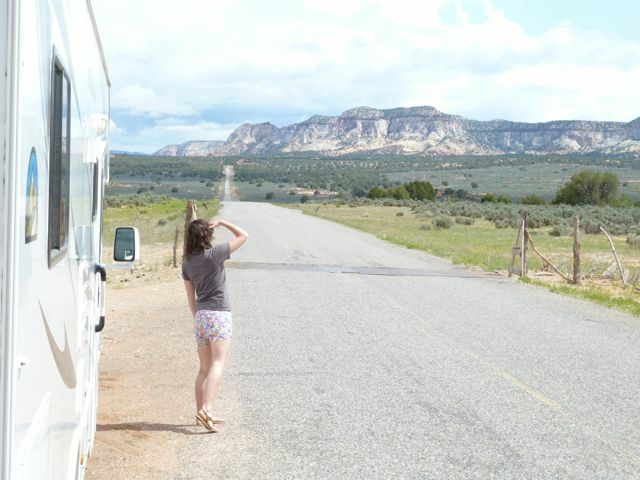 After making my opinion known, I left the RV really wound up. I calculated that, at my usual pace, I was on for a 20:45 finish. My anger, combined with a desire for an earlier finish, saw my pace increase dramatically. 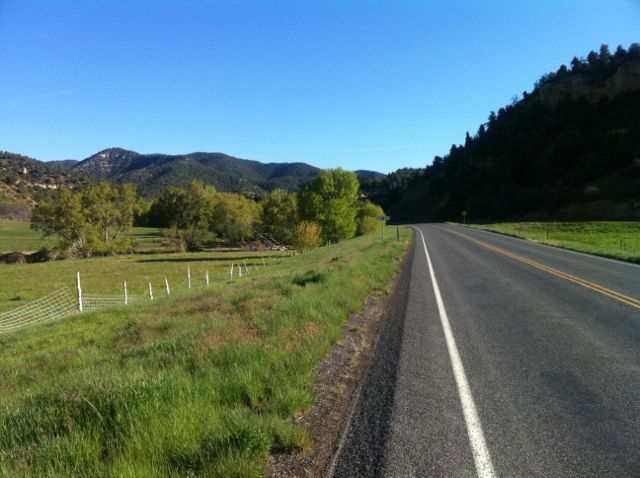 I managed to get the pace up to 11 minute miles and made my way quickly through the twisting canyons of County Road 91 with the Virgin Mountains as a pleasant backdrop. That final effort knocked 80 minutes off my projected finish time. 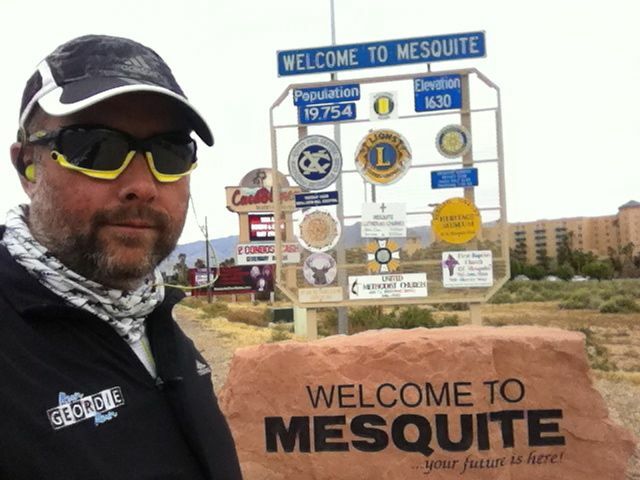 The end point for the day, after 31.4 miles was a very small town called Littlefield. It was situated just prior to the Interstate and was a sensible place to stop before tackling the very tricky next section. It was all set up nicely for day 17. 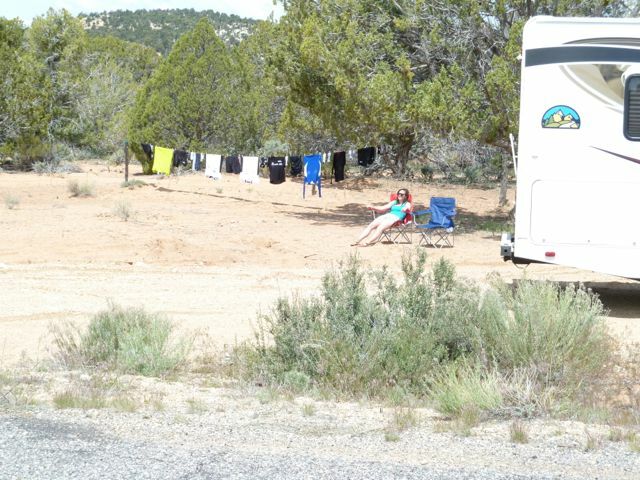 The overnight stop was at the Four Seasons RV park in Littlefield, Arizona. The owner, Harold, gave us what he called "a very special rate" to stay the night there once he learned about the reasons for the Support Team and I being in the USA. I spoke to Gary and Lisa on Real Radio while having a massage from Kirsty (below) that night. I managed to collect a few stats before speaking to them to include in the interview. 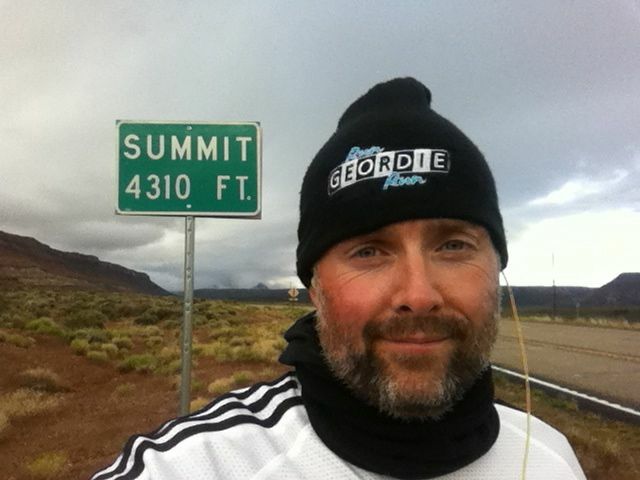 I'd ran 450.51 miles in 16 days, burning 58,188 calories and climbing 18,901 ft.
Due to the time difference the interview with Gary and Lisa was pre-recorded at about 05:30 UK time to be played on the show at about 07:30. I foolishly stayed up to listen to the interview not realising that there had been a change in time zone. 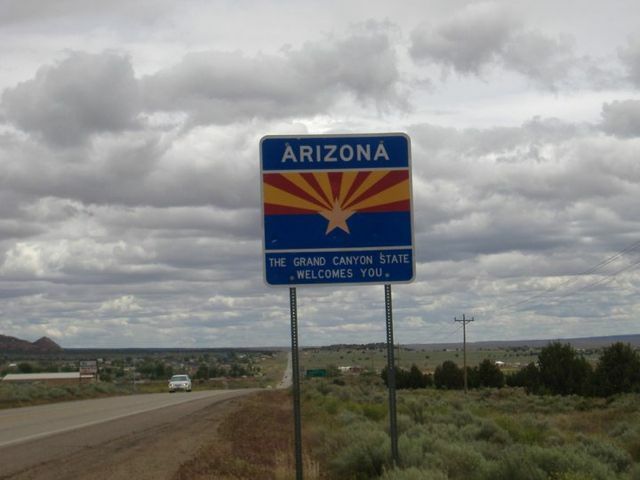 My final tweet of the day read "Just realised, we're in Arizona now so we lose an hour. It's 3 minutes to 1 am. Pants! ".